At the beginning of their visit, we took Bob and Vicki (by train, with correct tickets! though Allen forgot to stamp them) to Regensburg. I actually met them there because Ashlyn's ballet class was the same afternoon. I parked and walked onto the platform just in time to stamp my ticket and get on the train, with both children. 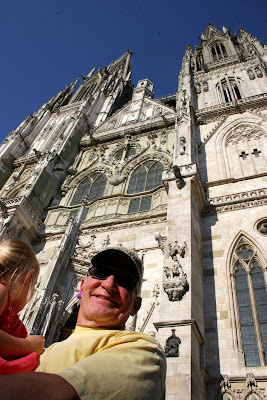 We walked around the historic centre of Regensburg. This is St. Peter's. Here I am with the kids at the oldest continuously operating sausage kitchen. 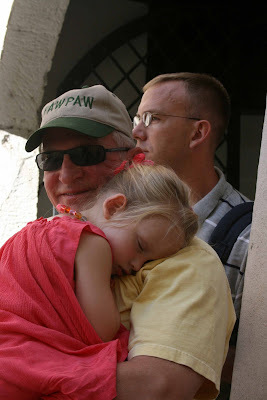 And, of course, we must have pictures of Ashlyn napping on all of our trips. Love the picture of you, Christopher and Ashlyn. 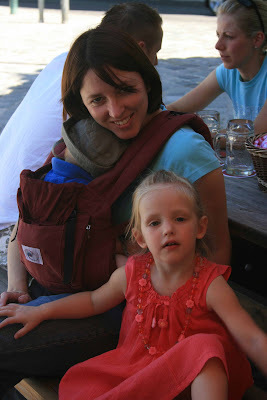 I wonder how many of FTW mom's have Ergo's now. My count is at least nine of us.